The First Britsh Slave Ship To Reach The Americas Was Called The Good Jesus! Yes. Sir John Hawkins had the dubious distinction of becoming the first slave-ship captain to bring Africans to the Americas. Hawkins was a religious gentleman who insisted that his crew â? ?serve God dailyâ?? and â? ?love anotherâ??. His ship, ironically called â? ?the good ship Jesus,â?? left the shores of his native England for Africa in October 1562. He arrived at Sierra Leone, and in a short time he had three hundred blacks in his possession. Hawkins claimed to have acquired them â? ?partly by sword and partly by other means.â?? (The Good Ship Jesus | The Beginning of the British Slave Trade) What has come to be referred to as "The Good Ship Jesus" was in fact the "Jesus of Lubeck," a 700-ton ship purchased by King Henry VIII from the Hanseatic League, a merchant alliance between the cities of Hamburg and Lubeck in Germany. Twenty years after its purchase the ship, in disrepair, was leant to Sir John Hawkins by Queen Elizabeth. Hawkins, a cousin of Sir Francis Drake, was granted permission from Queen Elizabeth for his first voyage in 1562. He was allowed to carry Africans to the Americas "with their own free consent" and he agreed to this condition. Hawkins had a reputation for being a religious man who required his crew to "serve God daily" and to love one another. 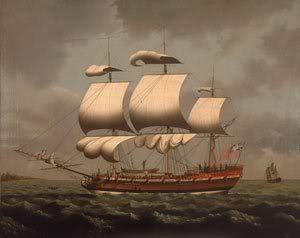 Sir Francis Drake accompanied Hawkins on this voyage and subsequent others. Drake, was himself, devoutly religious. Services were held on board twice a day. John Hawkins Coat of Arms A bound slave adorns John Hawkins' coat of arms. Off the coast of Africa, near Sierra Leone, Hawkins captured 300-500 slaves, mostly by plundering Portugese ships, but also through violence and subterfuge promising Africans free land and riches in the new world. He sold most of the slaves in what is now known as the Dominican Republic. He returned home with a profit and ships laden with ivory, hides, and sugar. Thus began the British slave trade. On his return to England Queen Elizabeth, livid, assailed Hawkins charging that his endeavor, ", was detestable and would call down vengeance from heaven upon the undertakers." When Elizabeth became fully aware, however, of the profits to be made she joined in partnership with Hawkins and provided him with the "Jesus of Lubeck," a.k.a., "The Good Ship Jesus." A later slaving expedition in 1567, consisting of five ships and the "Jesus of Lubeck," met with resistance from the Spaniards at St Juan d'Ulloa in Mexico. Since the slave trade was illegal Spanish colonists usually required a charade of force from British ships, after which they would buy slaves at a discount. This time, however, the Spanish attacked the British ships and the "Jesus of Lubeck," cumbersome and difficult to maneuver, was sunk and the crew slaughtered. Hawkins escaped with Drake on a smaller ship. Hawkins, his piratic ambitions dashed, returned to England and remained there in the service of the Queen. He gained distinction for his pivotal role in defeating the Spanish Armada and was knighted in 1588. I like rock songs! I really do! And my favourite yadrock band is Hootie and The Blowfish! All band members has reunited to give more than 50 concerts for their fans in 2019! To know more about Hootie and The Blowfish in 2019 visit website Hootie and the Blowfish tour Anaheim. You won't miss concerts this year if you click on the link! Yes the devils are still robbing Africa today! They have a great quantity of Gold. I don't understand why they are still getting away with this!. I just traced my ancestry back to west Africa! The Marka Tribe in Burkina Faso....just above Ghana.